I feel a little silly even posting this as a recipe, and I don’t normally post recipes that require possibly hard-to-find ingredients, but I love this so much I just have to share it. Last week I took a cooking class at Olivelle, a local store in Bozeman that sells olive oils, vinegars, salts, and spices. I’d never actually been in the store before I took the class on making crepes, and I’m guessing that was a solid financial decision as it’s very easy to spend a lot of money there. One of the recipes in the class used a Meyer lemon balsamic vinegar, and it is possibly one of the most amazing things I’ve ever tried. Sweet and tangy, I knew it would be delicious all on its own as a salad dressing. Although I managed not to buy the crepe pan (yet), I did walk out with this Meyer lemon vinegar and a caramelized garlic olive oil. I always buy giant bags of spinach for my breakfast smoothies, and I recently discovered Costco carries pretty reasonably priced sliced almonds as well, which are perfect for salad toppings. All that wonderful flavor and crunch without the giant pieces or the tedious chopping. As my raspberry bushes are finally producing in abundance this year, I can’t just eat them all straight off the bush before they get overripe. Although I will probably freeze some, mostly I enjoy them fresh as a topping on salad, yogurt, ice cream, and probably soon, waffles. They add a wonderful burst of color and flavor to a salad, and change it up from my normal mandarin oranges or strawberries. 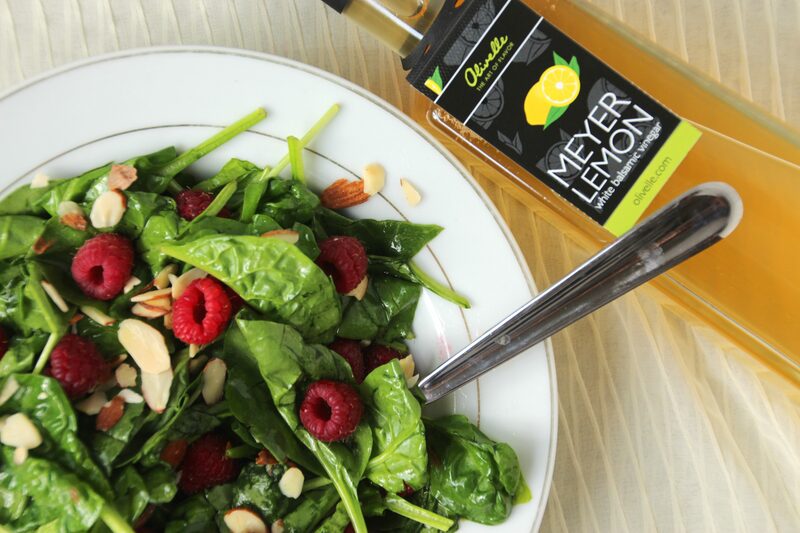 This salad is bright and tangy, and would go great as a side dish for almost any summer meal. I wrote out measurements for one, as that’s what I am usually making, but you can obviously increase it to feed several people at once. 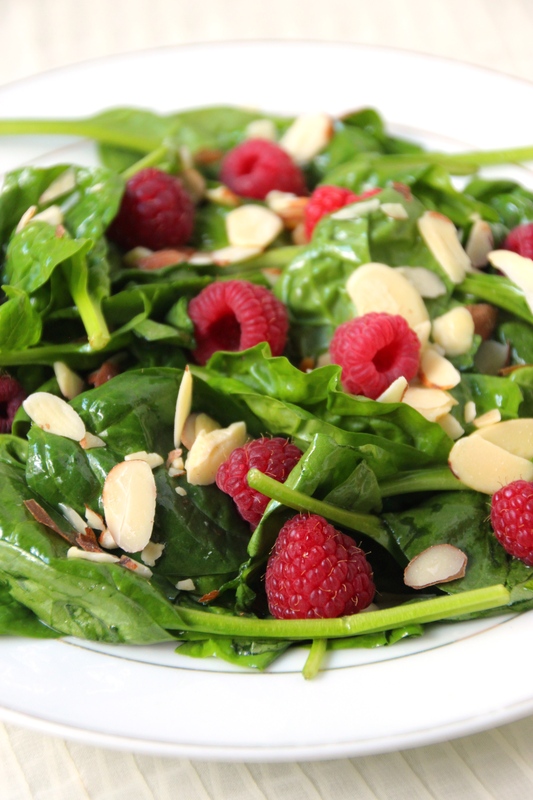 Make sure your spinach and your raspberries are reasonably dry and you are good to go for whatever quantities you like. If you’re looking to make this into an entree, I think some chopped chicken or fish would be an excellent addition. I’ve eaten it as a side dish most days since I bought it, but if I ever bought chicken I’d certainly give the entree a try. If you do, let me know what you think! And if you’re a local Bozemanite, get thee to Olivelle, pronto. 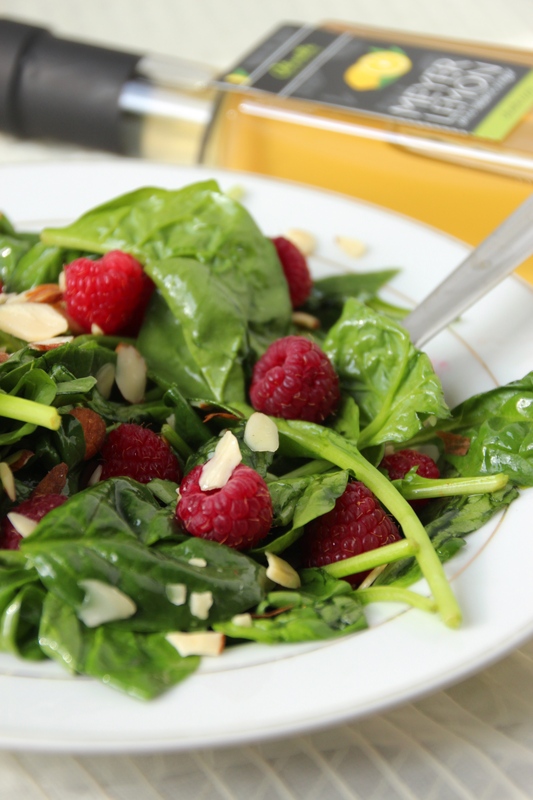 In a medium bowl, combine spinach and vinegar, and use a rubber spatula to gently stir until spinach is well coated.